On Monday night, I went to check out the off-Broadway show Sleep No More from the London-based company Punchdrunk. It opened in New York City last April, but I'm a bit embarrassed to admit that I hadn't heard about it until just recently. So when a friend said two spots opened up under his group rate, A. and I snatched them right up even though I didn't know just what I was in for. The film noir-type production is loosely based on Skakespeare's MacBeth (so feel free to brush up on the tragic tale before heading over) and peppers in influences from the works of Alfred Hitchcock, Stanley Kubrick, and David Lynch. Upon our arrival, we were given white Venetian beak masks to keep us from speaking and to distinguish between fellow audience members and actors (who wore no masks) and were free to wander through more than 100 rooms in the six floors of the shadowy 1930s McKittrick Hotel. We were pretty much there to invade these characters' lives. Okay, here's the thing. When I started reading the reviews to see what I was getting myself into and came across descriptors like "eerie" and "haunted house," I didn't think I'd be able to handle it. I don't respond well to the slightest bit of spook and thought for sure I'd be torturing myself by agreeing to go. There's also the fact that the audience is encouraged to experience the production on their own, to follow their instincts, and let their curiosity lead them on their own adventure. Plus, A. was not trying to pay $75 to babysit his girlfriend for nearly three hours so in the end I put on a brave face and was determined to see this thing through. Once I realized that there would be no startles merely for spooks sake, that nothing was going to pop out of the corner for the sole intention of freaking me out, and that everything that occurred was intentionally included to move the story lines forward, I was able to relax and enjoy the experience. There was no way in hell I was walking through a creepy cemetery scene on my own, but I did meander through the rooms opening books, reading random letters left on the tables, touching and admiring the incredible attention to details. Then I decided to follow a couple characters to get a better sense of the plot and was soon chasing them through the dark halls and stairways to keep up with their wordless stories. I'd even run into A. during a couple group scenarios, give him a touch to let him know I was there, and then dash off to keep following my own adventure. Aside from being beyond impressed with the details, I can't even imagine the staggering work that went into coordinating the choreography. The characters and story lines were interwoven and played out over the entire building so timing had to be impeccable - even with the dashing, interactions with audience members, and having to act through and around a crowd of people. The dancing was mesmerizing and at times intense though I do wish I had followed other characters to more action-packed scenes. I truly enjoyed being a part of the scene and sitting on the props as the story unfolded around me rather than watching it all from afar in a theater seat. The fun part came during a late dinner at Ovest Pizzoteca (which had a delicious prosciutto crudo and grilled eggplant panino) across the street from the McKittrick Hotel where we all shared what we saw, what we missed, who experienced what, and what would have made it better. I think the consensus was more perversion and mind f--ks to meet the hype. The only downside to the debriefing was that I felt like I had missed so much! ("Parkour?! A real candy store??") I wish I could have followed every character's story line and simultaneously paid more attention to the details in each room. It was just too much to take in during one visit, but the price tag makes it hard to do what I wish I could: keep attending to my heart's content and get answers to questions left hanging in mid-air. 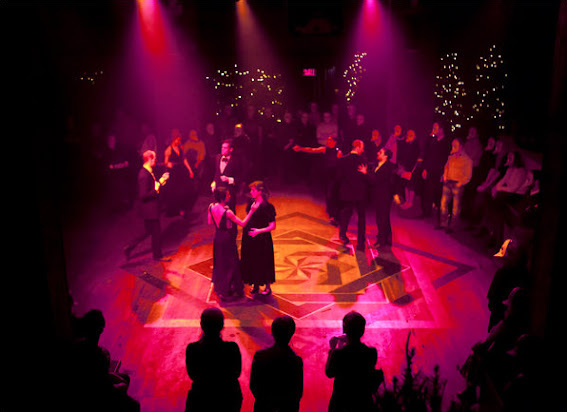 Sleep No More runs Monday through Saturday nights through May 12 at 530 West 27th Street. For tickets, which start at $75, visit SleepNoMoreNYC.com. Can I come stay with you and go?? This sounds absolutely fascinating. Seriously intrigued. Did you see the rave scene with the witches? I did! It was insane. Did you guys go see it, too?